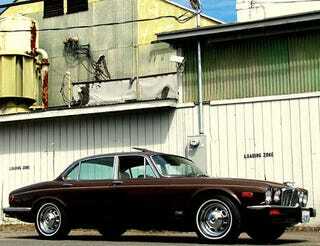 My adored '77 XJ6 is back in the shop for some repairs I have neither the time nor the space to complete on my own. The carbs have recently been rebuilt. The front left double wishbone suspension replaced. New front tires. A new oil pump. All of the vacuum leaks tracked down and cured. But now that the engine is running right, it's spitting oil everywhere. And the oil is eating through all the gaskets, causing the transmission to leak. And I still need to replaced the right front suspension and the mufflers. All-in-all, when the tech called to tell me what they'd found today, I'm looking at a repair bill that's more than I paid for the car. To date, between the shops and my own time and effort, I've easily doubled what the car is worth. But is this the time to say goodbye? I love this car, it's so pretty, so much fun to drive — when it runs. It's so hard for me to imagine parting ways, but in the end...it is a car. And I don't know if I can keep putting so much time, money and blood into it. And oh yes, there has been blood, and plenty of skin from my knuckles. So when do others give up the dream and move on? I'm hoping there will be more tales of woe to keep me company while I weep in the corner. And yes, yes, I know that having anything stuck together in England during the '70's is just silly to begin with, but just look at him?! That sure is a purty kitty. So easy on our eyes in fact that we are going to cop opt out and let you fine folks handle this one. Have another look before you mete out your advice. Good luck!